Sherway Farmers’ Market opened May 3, 2013. Farmers’ markets in Peel region open in June but there are quite a few in Halton opening in May. I am working on a local farmers’ market, farm market, and farm 2013 directory that I will post on my website soon. I’ll let you know when it’s up. As the season progresses, Sherway Farmers’ Market will continue to grow. Here is a glimpse of some of the wonderful treasures I unearthed while visiting Sherway Farmers’ Market last Friday. There is a delicious recipe for rhubarb at the end of this post. Husband and wife team, Sean and Shannon Declerc, offer an impressive bounty of foraged, wild mushrooms (when in season) and specialty cultivated mushrooms including Portabella, Shitake, Enoki, Crimini, Beech, Oyster, and these beauties, Cinnamon Caps, that are named for their cinnamon colour. Shannon described the Cinnamon Caps as their earthiest mushroom with a beautiful, rich, woodsy flavour. They are delectable in omelets, risottos, or in roasted meat gravies. Lion’s Mane is Shannon’s favourite. It has a milder, very fresh flavour, and a different texture than regular mushrooms, which Shannon says is appealing even to those who don’t like mushrooms. 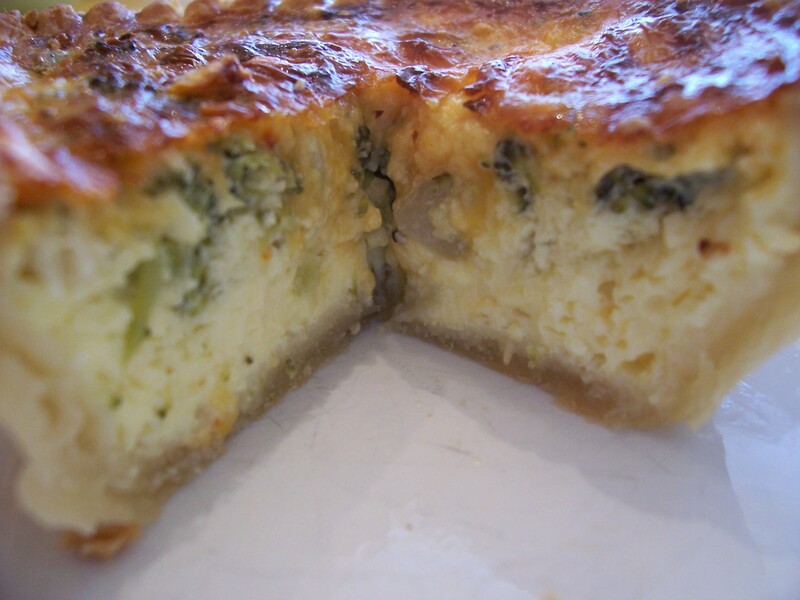 It’s very versatile and is great grilled, on pizza, or in soups. Mushrooms are porous and absorb liquid quickly. The Declercs grow all of their cultivated mushrooms on wood chips, so they don’t require washing. If you really feel you must, please just wipe them with a damp paper towel so you don’t disturb their delicate disposition. colourful Ontario greenhouse peppers, and Ontario greenhouse tomatoes. Ralph’s tomatoes are grown in soil and picked at a riper stage, making them more flavourful than most grocery store tomatoes (which are picked under-ripe to make them less fragile during transportation). Having been raised by a mother who grew up on superb Kent County tomatoes, I always search out the finest tomatoes I can sink my teeth into. I did a side-by-side taste comparison between some vine-ripened tomatoes I bought at a grocery store (and left sitting on my counter for a couple of days to ripen) and the Lise Farm tomatoes I bought on Friday. Compared to Ralph’s tomatoes, the grocery store vine-ripened tomatoes were still under-ripe and had a mealy texture. Ralph’s tomatoes were juicier and more flavourful, even though I ate them as soon as I got them home. It was a refreshing snack – a plate of Ralph’s tomatoes (adorned with nothing but a light sprinkle of sea salt) and a little bit of protein just to keep me ticking. I could not resist this sign, Freshly Dug Small White Potatoes. Doesn’t that sound fresh? These deserve to be boiled in their skin, smashed a touch with a potato masher, then tossed with my favourite extra virgin olive and some fresh mint that has been chopped in a dash of kosher salt to bash it all up and coax out the flavour. Abraham and Judith’s tables were laden with lots of delectable looking freshly baked goods including bread, sausage rolls, pies, squares, tarts, strudels, and these Dutch cookies that I have been searching for since my friend first got me hooked on them. They are called “Stroopwafels” (Syrup Waffles), a toothsome cookie consisting of sweet, chewy syrup sandwiched between two delicate waffle wafers. Lovely when placed over a hot cup of tea to soften the syrup. Bring your cooler to the market because Bert offers a great selection of his locally raised and processed, government inspected lamb products. According to a great article on Bert (The Amiable Shepherd: Bert Nieuwenhuis by Nicole Ross, June 19, 2012 http://www.inthehills.ca/2012/06/departments/the-amiable-shepherd-bert-nieuwenhuis/), Bert’s products are popular with chefs and locals in the Headwaters region, so we are really lucky that he brings them down to Sherway Farmers’ Market. He sells lamb shanks, racks, legs, chops, burgers, roasts, organs, and even lamb heads. His lamb liver pâté sounds enticing. 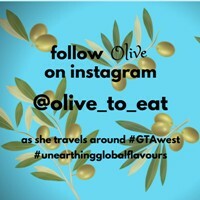 Next time I run into Bert, (perhaps at the Orangeville, Inglewood or Caledon Farmers’ Markets) I will be sure to have my cooler with me because olive Ontario lamb. I was so happy to see local field rhubarb at the Andrews’ Scenic Acres stand. I can’t wait to visit Andrews’ Scenic Acres farm to pick my own asparagus, on the first sunny day that is available to me. I will tell you all about it on an upcoming post. As we move further into the growing season, the Andrews’ Scenic Acres stand at Sherway Farmers’ Market will be brimming with all sorts of fresh produce. I can’t wait for the berries. This little gem of a recipe is a delightful way to enjoy rhubarb. The recipe comes from The United Churches in Canada Let’s Break Bread Together cookbook, a compilation of tried and true, treasured recipes submitted from United Churches across Canada. 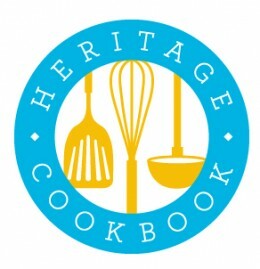 The cookbook was compiled and published by the United Church in Meadowood, Winnipeg, Manitoba, in 1988. It is still available for purchase from Derksen Printers. Please see the full details and the link at the end of this post. It is well worth purchasing and would make a great addition to a novice cook’s library. The Rhubarb Torte recipe was submitted by Brooks United Church in Brooks, Alberta. It’s an easy recipe that will make a confident baker out of an apprehensive one and a rhubarb lover out of anyone. Olive it! Thanks very much to the United Church in Meadowood for permitting me to share this recipe with my readers. The tartness of the rhubarb is tamed by the creamy custard filling, which sits atop a rich, buttery shortbread crust and is topped with a soft and billowy meringue. The recipe calls for a 9″ x 9″ pan but if you only have an 8″ x 8″ pan, it will still work out beautifully. In that case, you will have to cook only the filling a little longer than directed. Preheat oven to 325°F. Mix, by rubbing between your finger tips, until mixture turns crumbly. Press into a 9″ x 9″ pan. Bake for 20 minutes on the middle rack. Mix the first four ingredients well. Stir in the rhubarb. Spread evenly over crust. Bake 40 minutes, or longer, until filling is set. Increase oven temperature to 350°F. Meanwhile, prepare meringue. Beat the egg whites, slowly adding the sugar one tablespoon at a time, just until soft peaks form and whites look glossy. Spread gently over filling. Bake for 15 minutes at 350°F until meringue is golden brown. Chill until ready to serve. Recipe may be doubled for a 9″ x 13″ pan. Every Friday from 8:00 a.m. to 2:00 p.m., May 3rd to October 25, 2013. Look at what the Easter Bunny brought me! A heavenly Orange Chiffon Cake from the Hot Oven Bakery at Cloverdale Mall (for the very reasonable price of $10). The soft-as-a-cloud cake is drenched in a delicious sugar glaze that is punctuated with bits of chewy orange zest. The orange flavour is bright and real and balanced nicely by the sugar. The cake stands pretty on its own but can be dressed up in a couple of ways. It would look lovely with edible flowers or candied violets. Longo’s carries edible flowers (in the herb section) but were all out of them the day I went. I picked some pansies from my pot to give you an idea of how pretty the cake would look. The pot however is looking a little bleak. Imagine it wrapped up in cellophane, tied with colourful ribbon and given as a hostess gift! 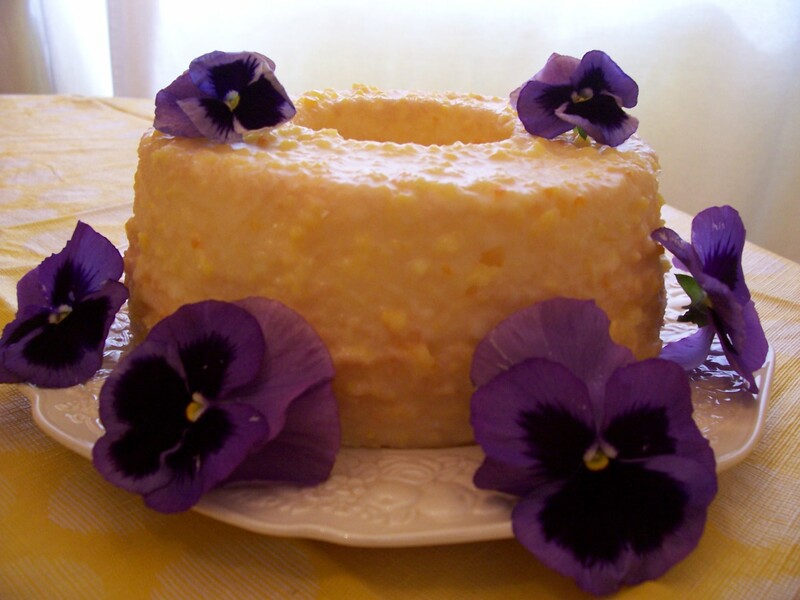 I think I will bring one, decorated with candied violets (if I can find them), to my church ladies’ spring potluck. Wouldn’t I just be the cat’s meow? A tip of the old Easter bonnet to me for sure. The cake is so flavourful that it can go easily from plate to mouth without anything accompanying it. My guests served it with orange sherbert which was yummy, especially for kids. They say that Orange Creamsicle ice cream is good too . It is oh so delightful served with a dollop of whipped cream and segmented orange chunks that have been dusted with cinnamon. Cara Cara oranges are really sweet and juicy right now and are on sale at Longo’s for 99¢/lb or $2.18/kg. I have to thank my friend for introducing me to this cake. She has been buying it now for at least 10 years. She is wonderful at putting in the effort to make homemade desserts. 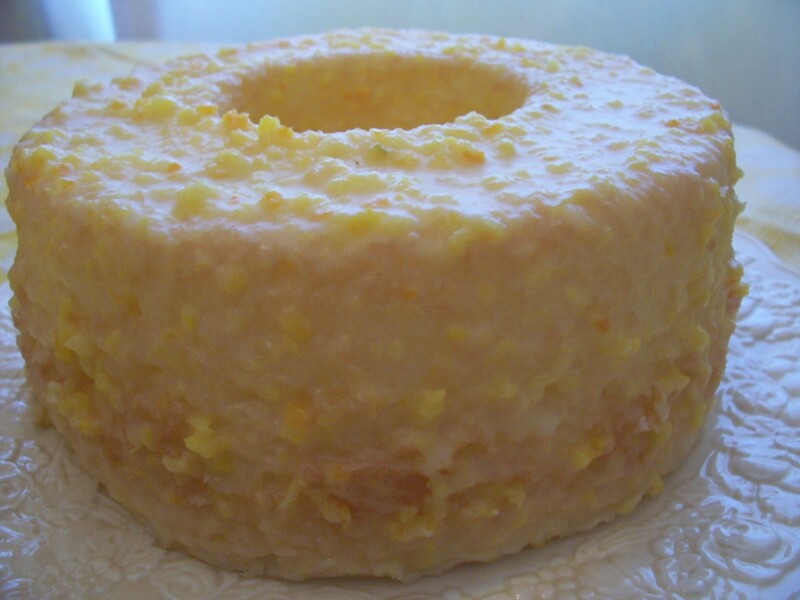 But when she doesn’t have time, the Hot Oven’s Orange Chiffon Cake is her go-to-cake because it tastes homemade and yummy. It’s gotten her through many a pinch on her way home from work. There’s nothing else like it that brings her back time and time again. and fudgy brownies with intense chocolate flavour and real butter icing. It’s calling you. Tempting, isn’t it? It was so hard to wrap up the rest of the brownies from the Family Brownie Tray ($5.50) and store them in the freezer. The mac & cheese, lasagna and perogies all looked delicious but I had to stop somewhere! 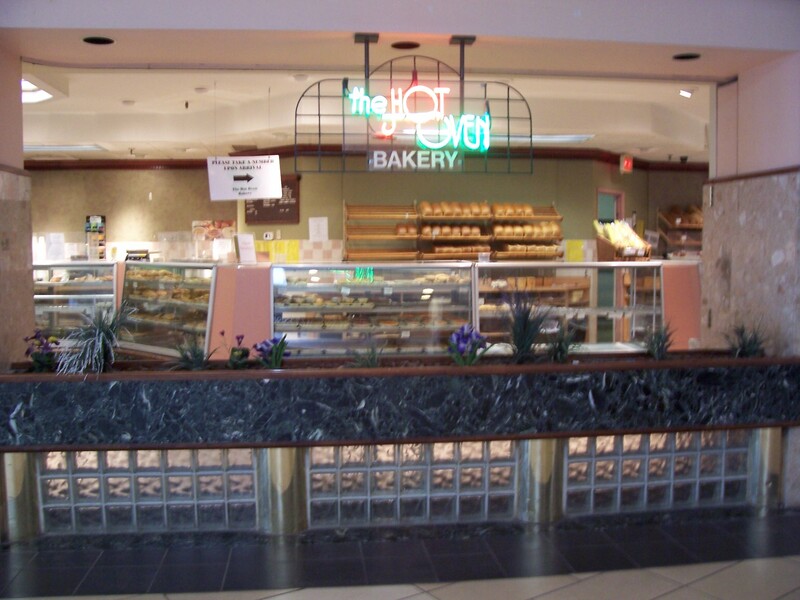 The Hot Oven Bakery, located right beside Winners at the south end of Cloverdale Mall, has been in its original location since 1957. My friend and I have been BFFs for almost as long (not quite). On the morning I went, the bakery was almost empty when I walked in but a line started to form quickly. My friend went on the Thursday before Easter weekend and there was a huge line. You see that sign in the photo to take a number as soon as you arrive? Good advice that you must heed. But whatever the length of the line, it is definitely worth the wait. The ladies that I spoke to, who have been loyal customers for decades, told me that everything was good. There are three other Toronto locations that have opened up which are all owned by the same owner. These locations appear on the company website but even though the Cloverdale location has the same owner, it isn’t listed on the website. But don’t worry about that. Just go, take a number and line up the old fashioned way and go home with an armful of delicious home-baked goods made from high quality ingredients and sold at reasonable prices. Monday – Friday: 8:00 a.m. to 8:45 p.m.
Saturday: 8:00 a.m. to 5:45 p.m.
Sunday: 12:00 p.m. to 4:45 p.m.